It’s been an exciting few weeks. 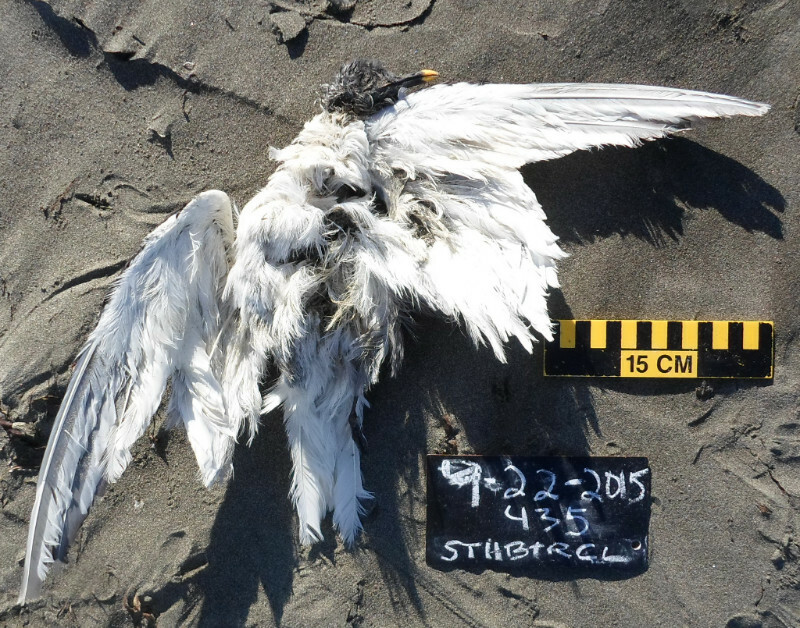 In the office, we’ve been busy taking a look at the Common Murre die-off and gearing up for the official launch of our new marine debris program. Our first trainings are scheduled for Forks (WA), Port Angeles (WA), and Newport (OR) next month. Additionally, COASST Executive Director, Julia Parrish, recently returned from a trip to the White House, where COASST was recognized on multiple fronts as an example of a citizen science program providing useful data to scientists and resource managers. Big thanks to all of you for all of your hard work! Here’s a fun one! Barbara and Mike had “never seen anything like this bird” when they came across it during their September survey on South Butterclam in Washington. Choose webbed (go to Q2), completely webbed (go to Q3), four toes: 3 webbed 4th free (go to Q5), tarsus not >12mm across (go to Q6), thin toe or nail only (go to Q7), heel swollen – STOP: Larids. On LA1 –Bill is hooked, Gulls and Kittiwakes (go to LA2). Wing Coloration: triangular dark-white-dark pattern. Go to species pages: Red-legged Kittiwake (immature) LA16 or Sabine’s Gull, LA20 The wing is within the SAGU range (26-29cm) but not outside of reason for RLKI (29-33cm). If we look at “Similar Species” we see that SAGU inner primaries are white, as opposed to gray with white tips. Sabine’s Gull it is! Notice its dark bill with yellow tip (adult!) and dark head (breeding!). Red-legged Kittiwake (too rare to be in the guide). Can’t rule it out, so let’s stick with Group: Gulls and Kittiwakes, species unknown and let Charlie work his magic. Sabine’s Gulls are so rare in the lower 48 that they aren’t even mentioned in the West Coast Guide! During her June survey on Agate Beach in Northern Oregon, Wendy found quite a bit of bird variety, including this tricky specimen. Tarsus measurement more fitting for FTSP and plumage gray rather than dark sooty brown. No white rump patch. Fork-tailed Storm-Petrel it is! 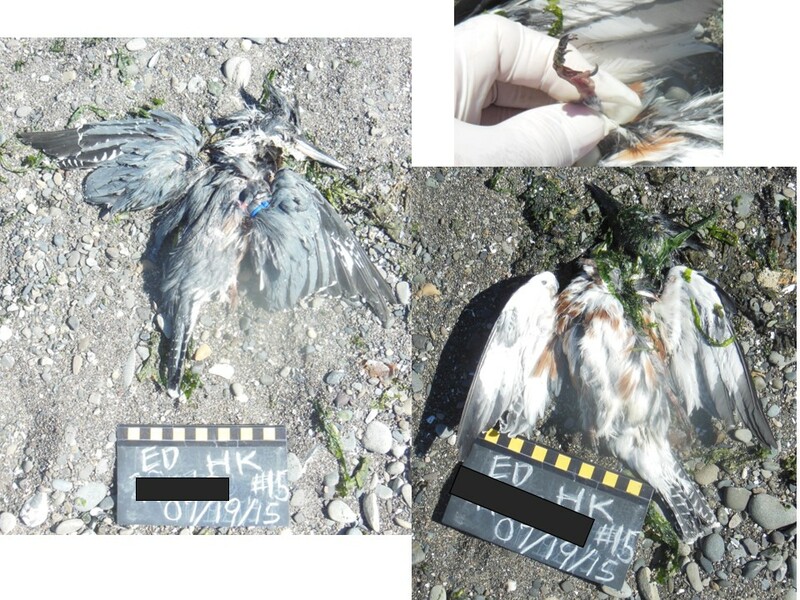 The Harps found the 7th COASST bird of its kind on their July survey on Ediz Hook in Washington. Choose free (go to Q9), 4:3 front, 1 back (go to Q10), two toes are fused! STOP: Kingfishers are as far as the COASST guides will take you—this one is a Belted Kingfisher. 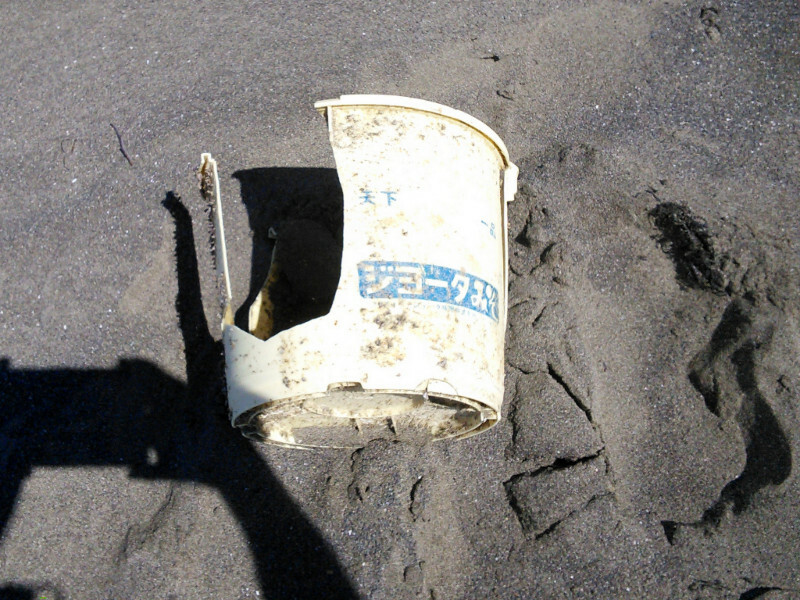 Keith found this “bucket” on Steamboat Creek in July. Amanda and Chris identify and translate the object as follows: In the small, blue kanji characters on top) 天下一品=Tenka Ippin=”Best thing on Earth” (In the larger white characters in the blue box below) ジヨータみそ=jiyota miso. The contents are probably bean paste that is put into miso soup, among other things. Tenka Ippin is apparently a restaurant chain in Japan that specializes in ramen. What a find! 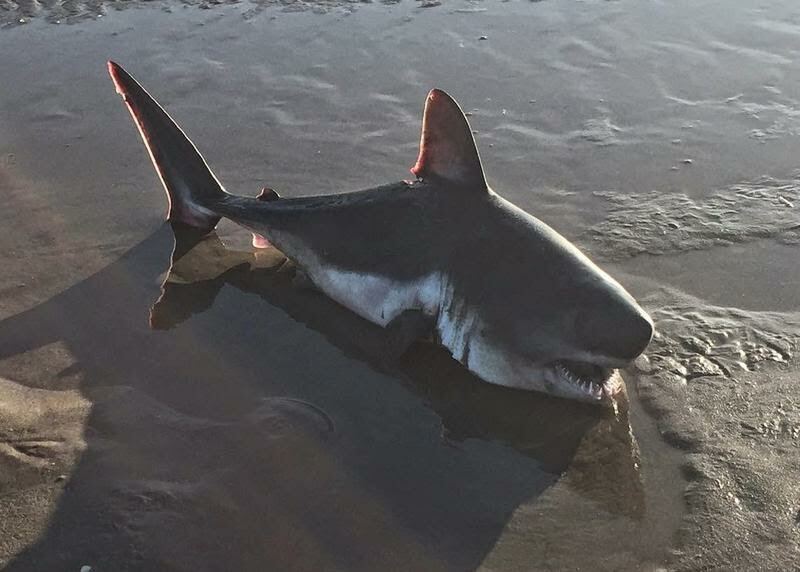 Olli sent us this great shark photo from Cape Meares, Oregon that Katherine Maslenikov, Collections Manager at the UW Burke Museum, confirmed to be a salmon shark. Salmon sharks have a slightly bulbous body with a conical snout and are usually found roaming the subarctic and temperate North Pacific. As you might guess from their name, they feed primarily on Pacific salmon, but they will occasionally snack on other bony fish as well. Typically, they are about 6.5-8 feet long, but they can reach up to 10 feet in length! This entry was posted in Uncategorized on October 22, 2015 by coasst. 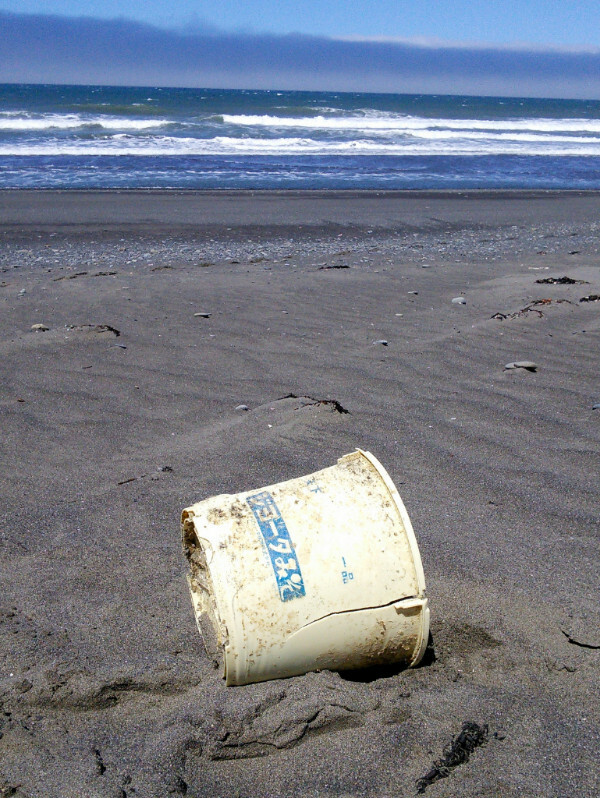 creates the perfect storm for effective citizen science. The auditorium was crowded with guests. Mike Brubaker from the LEO Network was there. 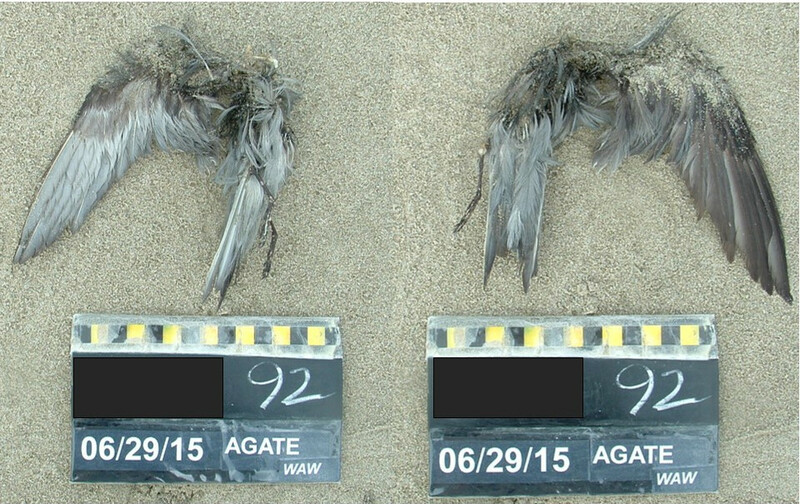 Just last week I gave a LEO webinar about the Common Murre die-off. Also present were Nolan Doesken – the brains, energy and boundless enthusiasm behind CoCoRaHS (if you don’t know about this weather citsci project, you might want to sign up! ), Karen Oberhauser – the woman who has singled handedly pushed Monarch butterfly citizen science to new levels, and Gretchen Lebuhn, who spearheads the Great Sunflower Project. COASST was in excellent company. John Holdren, the President’s Science Advisory and the head of the Office of Science Technology Policy, spoke to us about the power of citizen science and how the federal government can, and should, do more. To that end, he released a policy memo outlining what The White House and the federal agencies can do. And COASST is called out as a great example of how to do citsci right (pg 10-11)! YaHOO!! France Cordova, the Director of the National Science Foundation, gave a great speech about the power of rigorous citizen science to advance all of science – citsci as a bonafide tool in the science toolbox. Turns out she used citizen science data in her own PhD research (astronomy). And wouldn’t you know, Dr. Cordova also called out COASST as a shining example of citsci done right, with our data used by scientists and resource managers alike. Double YaHOO!!! As if that wasn’t enough (and actually, it was – I was already on cloud 9), the next day I had the chance to speak to staffers of our Washington delegation about COASST and the great work we do. Upshot? Senator Patty Murray tweeted congrats to us! Hat-trick YaHOO!!! 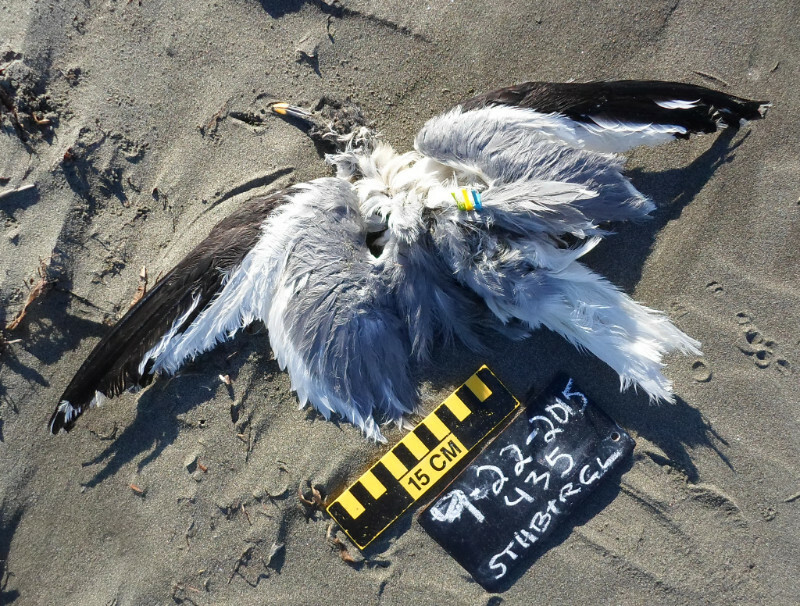 Now I’m back in Seattle, leaping back into the Common Murre die-off, moving our new marine debris sampling program forward, and working with a myriad of scientists and resource managers who are using COASST data. It’s all COASST all the time, which is just how I like it. And it’s a great feeling to know that thousands of miles away in the other Washington COASST is getting well-deserved recognition as an exemplar citizen science program. And that’s quite simply due to the continuing efforts of hundreds (and hundreds!) of COASSTers out there every month. Hat’s off to you!!!! This entry was posted in Uncategorized on October 7, 2015 by coasst.